Everything you need to take on the jungle or a horde of zombies is in this awesome package. 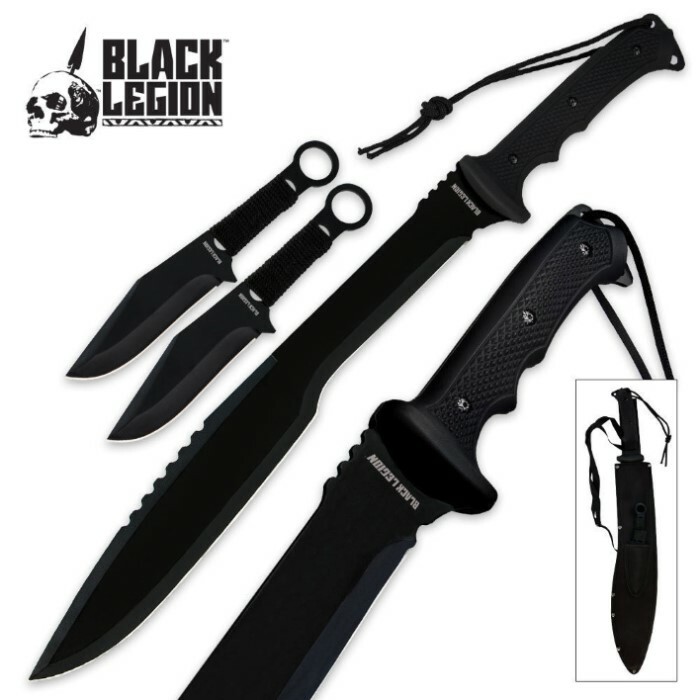 It is a three-piece ninja set that includes a full-tang machete and two throwing knives. Each blade features full-tang stainless steel construction with an anodized black finish and sharp edges. The two throwing knives feature a 3-3/4" clip point blade with a piercing tip and cord-wrapped handles with open-hole pommels. 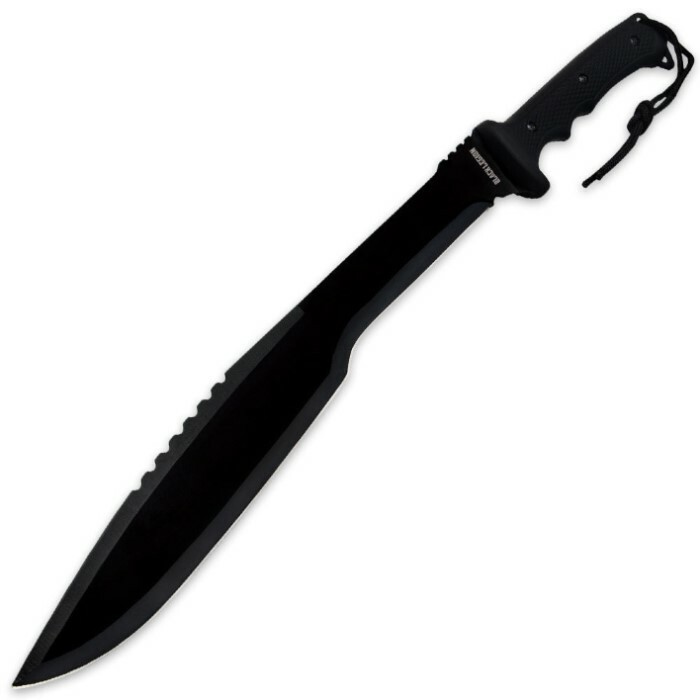 The machete provides an 18" blade with fantasy-style sawback serrations and a rubberized grip with a non-slip texture. 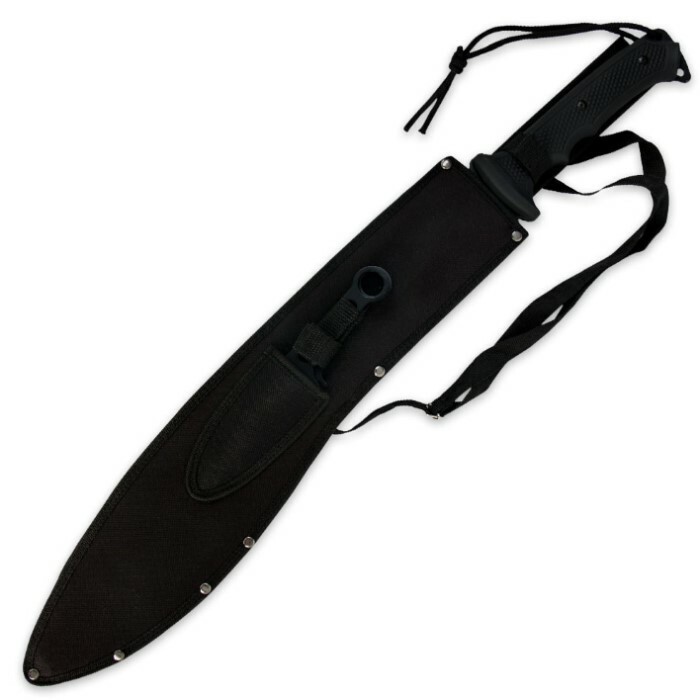 The complete set comes sheathed in a custom shoulder sheath so you can take it everywhere. Got these on a BOGO deal and holy cow!! Way better than I anticipated!! Nice straight full tang blade, sturdy handle so far, came nice a sharp except for the angle in the blade where it curves forward, just that mid blade point could use a touch up. Throwing knives are sturdy solid piece that seem to be fairly balanced. I'm buying 2 more after I get done typing!! Got this for free from the offer a while back when i got a nice Katana. But this thing is amazing, sharp out of the box, having a blast with the throwing knives, very sturdy and noce for a stainless steel blade. Would definitely be worth the cost by itself. I received these for free! I ordered the Raging Waters Katana and this was part of a daily special, they are great and came very sharp. thanks AGAIN BUDK.. A HAPPY CUSTOMER!!! The machete itself is nice, exactly what I was hoping for. It's sharp, has a good point, and feels great in the hand. The throwing knives, on the other hand, aren't the most durable things I've ever thrown. While my dad and I were throwing them at a wooden disk, one of the knives actually broke at the bottom of the tang, and the other cut through its own cord wrapping on the tang. The broken one is still salvageable, but it won't be a thrower anymore. The other one, well, that depends. So, if you're looking for a good machete as a gift, this one will do, and it even has a nice bonus that you might be able to use for hunting purposes. But I would not recommend using the knives recreationally on a hard target. For the price, just the machete is good enough, though. The knives are nothing to complain about, they're just a nifty bonus feature.